One wouldn’t—and shouldn’t—watch horror movies by daylight. And it’s just common sense that reading scary stories under the glare of the sun saps their strength, like a vampire. So it would only follow that one shouldn’t write about horror during the day. One needs shadows and a little bit of quiet. (An empty house and a candle help, but let’s not be sticklers.) Following my own rules, here I am as late afternoon slowly turns to dusk on a crisp October evening, and by the time I’m wrapping up with this first entry in our annual Great Pumpkins series—in which we offer seven films curated for your holiday pleasure—twilight will have long fallen. I haven’t turned a light on yet, using only the glow from the laptop as a beacon in the gloom, leading me through the brambles of thought that will get me to where I want to be: to an understanding of fear. For eleven years now, we’ve been offering scary movie suggestions to our readers—not just to share movie recommendations, but to try and figure out what is scary and why. Horror movies are often the territory of cultists and collectors, their transgressions spoken of gleefully. But harder to define than a horror movie’s rule-breaking is its ability to disturb the viewer on a profound level. When it does, it’s because it has managed to say something unsettling about our world, and therefore has communicated some kind of truth. For its ability to cleanly allegorize, the short story form has long been the greatest vessel for horror. A great short story writer gives the reader just enough to shake them up. Rarely am I more haunted by a work of fiction than in short form: Shirley Jackson’s “The Summer People,” M. R. James’s “Oh, Whistle and I’ll Come to You, My Lad,” William Faulkner’s “A Rose for Emily,” Edgar Allan Poe’s “The Masque of the Red Death,” W. W. Jacobs’s “The Monkey’s Paw,” Nathaniel Hawthorne’s “Young Goodman Brown”—none of these offer enough incident or scope to sustain a full novel. And none of them betray all of their mysteries. You leave each of them puzzling a little over what you’ve just read. The simplicity itself is sinister: they boil life down to the bone. Short films, on the other hand, are largely missing the precise clarity that comes from one writer’s succinct vision. Even the briefest film is by necessity collaborative. There have been fine feature film extrapolations of short tales (Corman’s The Masque of the Red Death, although it had to be changed considerably to fit 90 minutes); short films that sufficiently adapt and update famous tales (Mario Bava’s The Drop of Water is an effective variation on Poe’s “The Tell-Tale Heart”); and rare original short films that manage to get at the limpid brilliance of the best scary stories, especially Antonio Mercero’s 1972 La Cabina (a prior Pumpkin selection), so adroit at exploiting so many fears within the course of just 30 minutes—political, social, physical—that I am still yet to get over the experience of watching it. Then there is the film that gets my vote for the greatest short film ever made, and which—for some reason I’ve never quite been able to understand—is never discussed as a horror film. 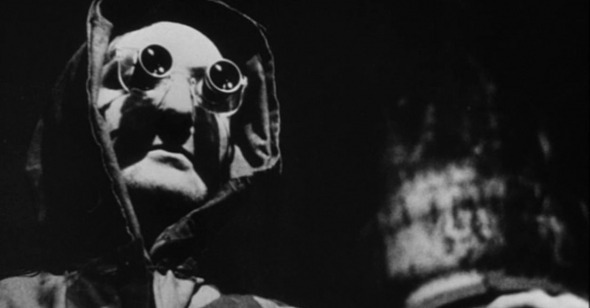 La Jetée, Chris Marker’s structurally adventurous, aesthetically sublime 1962 dispatch from the margins of the French New Wave is often referred to as science fiction, and it has all the hallmarks. Yet for this viewer at least, those generic touchstones—time travel, post-apocalypse, fiendish experiments, existential terror—read just as easily as horrific. And Marker’s ability to weave his radical, fearful ideas about our grim world and our darkest selves into a thoroughly disturbing, disorienting aesthetic experience put this unsettling masterpiece in the territory of sublime horror. Every second of La Jetée’s 28 minutes counts, contributing to an overall sense of a world both stuck in a terrible freeze frame and spiraling out of control. Its pattern is sinister, its effect devastating. Credited as a “photo-roman,” La Jétee is a chilling tale of future shock told in evocative black-and-white still images; the effect is oddly like a campfire tale, narrated in dulcet tones by Jean Négroni. Set in Paris after World War III, during which the city was decimated by a nuclear bomb, Marker’s film nevertheless begins with a personal vision of the past: our narrator recalls a terrible, traumatizing incident from his childhood at Orly airport, where he saw a man running toward a beautiful woman only to be gunned down and killed. The man, “marked forever” by this image of death, is now living underground with Paris’s other postwar survivors, who have created a network of tunnels and bunkers to protect themselves from radioactivity. Marker shows us eerily beautiful images of the tragic aboveground, a city aflame: the Eiffel Tower still standing but surrounded by thick black smoke; the Arc de Triomphe in pieces; streets of rubble. Below, our narrator has been imprisoned and enlisted as a guinea pig in the time-travel experiment of a “mad scientist, a Dr. Frankenstein.” The only hope left for the human race is to alter time itself, to reach earlier or later periods for food and supplies. These experiments are depicted as harrowing, with the man blindfolded and writhing in ambiguous agony, while stern faces of authoritarian dread emerge out of inky darkness, and heartbeats and unintelligible whispers eerily fill the soundtrack. We are told that this leads to madness for some, death for others: in one of the most unforgettable images, a haunted wild-eyed man looks past the camera, his expression registering as immobilized horror. We never learn who he is, but in a stagnant world, his frozen face is all that matters. One can imagine that if La Jetée were told in motion pictures it would be less convincing as science fiction; the photographs make it more vivid, elemental, less reliant on the minutiae of behavior. In his travels, the man continually returns to the woman of his childhood dreams, an image of perfection so impossible that she’s unnerving. This is just one aspect that connects La Jetée to another terrifying tale of obsession that’s not often enough called a horror film: Hitchcock’s Vertigo. (If the death-shrouded nun rising out of the floor in that film’s last scene isn’t American cinema’s ultimate image of primal horror, then I don’t know what is . . .) La Jetée is a ghost story, haunted by its protagonist’s nightmares, haunted by the wandering spirits of the human race, haunted by war, haunted by Vertigo—the man and woman visit a cut-down Sequoia tree, just like Scotty and Madeleine. At one point the film even seems to be possessed by a spirit, when the dream woman, bathed in sunlight, looks directly at the camera and opens her eyes, a seamless transition from still images to film, life unexpectedly reanimated before it quickly cuts back to tragic, dark reality. “I’m not easily frightened,” insists Betsy Connell, the intrepid heroine of I Walked with a Zombie. Over the course of its 69-minute running time, Jacques Tourneur’s 1943 film will find plenty of ways to challenge that assertion. At once the most pungently atmospheric and narratively unusual of the films Tourneur famously directed for producer Val Lewton at RKO in the early 1940s, I Walked with a Zombie has endured as a genre touchstone and pop-cultural reference point; it’s been immortalized in song by Roky Erickson and in print by Thomas Pynchon, and paid tribute to onscreen by George A. Romero and Pedro Costa, whose Casa de Lava (1994) has been described as a remake of sorts. But viewing the film through the magnifying glass of its classic status—or else through a literary lens as a sideways adaptation of Jane Eyre, or even adopting an academic gaze to penetrate its surface and perceive deeper postcolonial themes—distorts its very real, if low-key, excellence as a scare machine. Take, for instance, the early scene in which nurse Betsy—who has decamped from Canada to the equatorial (and fictional) Caribbean island of Saint Sebastian—first meets her patient, Jessica Holland (Christine Gordon), whose supposed status as a bedridden invalid is contradicted by the glassy-eyed sleepwalking routine she performs in the middle of the night. Lurching slowly toward Betsy in a white robe, she could be the Bride of Frankenstein, and the Gothic backdrop—a cavernous, high-ceilinged chamber that resembles a crypt—gives the brief encounter the feeling of a nightmare. And yet what’s truly creepy here is not the staging and outcome of this midnight meeting but the disparity between Betsy’s (and our) shock and confusion and the resignation of the people around her, who take her nocturnal peregrinations as a matter of course. (Rod Serling, among others, understood that the gap between experience and understanding was the true Twilight Zone). “She makes a beautiful zombie, doesn’t she?” asks the town doctor as if the answer weren’t as plain as the nose on Jessica’s perfect, immobilized face. If I Walked with a Zombie is a fairy tale, then Jessica is its Princess Aurora, eternally condemned to be a Sleeping Beauty by a powerful curse. The difference is that the spell here is never going to be broken, only spread like a virus among the inhabitants of the Holland plantation; in the film’s climax, Jessica’s former lover, Wesley (James Ellison), will be stricken with the same affliction and enact a ritualistic murder-suicide by carrying her into the ocean—a sickly fitting end for a man apt to drown his sorrows in bourbon. Meanwhile, Jessica’s husband, Paul (Tom Conway), is, even as the film begins, akin to the walking dead, keeping amorous Betsy firmly at arm’s length partly out of grief for his wife and partly because he’s no less susceptible to the force of his family tragedy. The Hollands are wracked by sibling rivalry, adultery, alcoholism, and guilt, vulnerabilities that are both juxtaposed against—and folded into—the ceremonies of the local natives, whose manipulation of Jessica as a flesh-and-blood voodoo doll is percussively edited and scored in an inexorable crosscut montage. One might wonder if the latest film from Kiyoshi Kurosawa—called just…Creepy—is some kind of a joke. The title alone has the feel of a later-career Wes Craven-esque trinket that exists only to excavate tropes and concerns of earlier films and drench them in irony (see: Scream, Red Eye). Or are we in the presence of a throwback to the early part of Kurosawa’s career, when he was making films for video with titles like Suit Yourself or Shoot Yourself and The Revenge? For the film’s first third or so, Kurosawa could plausibly behaving one over on his audience. After a bloody prologue that sees detective Takakura (Hidetoshi Nishijima) bested in a hostage negotiation by a serial killer, Takakura, now retired from the force, and his wife, Yasuko (Yûko Takeuchi), begin life in a small town. Almost immediately they start turning up uneasy truths about their new neighborhood. The first of the neighbors they meet shoos them away, brusquely expressing peculiar distrust of their attempt to deliver a small welcome gift. At the second house they visit, the bell rings ominously to no answer. The score suggests bad things will happen here. Determined, plucky Yasuko goes back the next day and meets Nishino (Teruyuki Kagawa), who seems the living embodiment of the title. He’s uncomfortably friendly and obsequious in one moment, icy and menacing in the next, his face deadened at either pole. His acceptance of Yasuko’s welcome gift spans a spectrum of human response that suggests oddity at best, mental disturbance at worst. Later that evening, he’s accosting Takakura in the street and warning him to keep his nosy wife out of his business. He’s so frightening in this interaction that it’s a surprise when Nishino and his young daughter turn up at Yasuko and Takakura’s house a few nights later for dinner, all smiles. At the same time as the couple is learning to deal with their weird new neighbor, one of Takakura’s colleagues at the local university where he’s taken up a teaching post, a criminology researcher infatuated with the idea of having a former real detective on staff, cajoles him into returning to the scene of an unsolved disappearance to poke around. This triggers his erstwhile police colleagues to seek him out and ask for help resolving the case. Their investigations point to a character not unlike Nishino . . . could something so utterly coincidental be possible? Did Takakura move right next door to the kind of serial killer he’d hoped to leave behind him? For a while, things seem so tidily plotted that we suspect Nishino is the most obvious cinematic MacGuffin in some time. That is until Kurosawa reveals to us that everything is just as it seems, that the unlikely connections teased out thus far are tighter than we could have realized, and that there really is something creepy and perhaps even truly terrible happening next door. But the goings-on at Nishino’s house, inexplicably (almost comically) featuring a long, dank passageway the leads to a metal cell with a heavy, rusted door, do prove to be something of a misdirect. What Creepy is actually concerned with is something different: namely, Takakura and Yasuko and how their marital relationship has deteriorated over time via neglect and apathy, and how this might actually put their lives at risk. Kurosawa’s not big on origin stories, so we’re never clued in to why these two have grown apart. Things seem cordial between them through the first half, but no more than that. But as Takakura and Yasuko individually unearth more and more information about Nishino that suggests he’s a threat to their lives, their lack of communication grows increasingly dangerous. You know the bit. If you’ve seen Jacob’s Ladder, you know the bit. The party scene: no, not the crude bit where the winged demon seems to be ravishing Elizabeth Peña. Right before then—that figure in the background, behind the partygoers, he’s masked, then he’s not. His head jags to one side quicker than it should be able to. He’s looking right at us. Then he does it again: then for about a hundred frames, no more, his whole head is vibrating like the tail of an angry rattlesnake. But the effect isn’t the same as the head movement from earlier in the film that it is imitating: that of Ving Rhames’s startling, blood-spraying seizure during combat in Vietnam four years earlier. This one, accompanied by faint, hair-trigger rhythms of helicopter rotors, is somehow more metaphysical. More . . . cinematic. Like jump cuts. Are they jump cuts? How is this so horrifying? Jacob’s Ladder keeps one guessing like this, right from the titles: why does this Vietnam flick, directed by Brit super-hack Adrian Lyne under a macho Carolco carapace, star Tim Robbins instead of Arnold? Why do we hear a Chopin-esque piano score by Maurice Jarre instead of Michael Kamen synths? As the film progresses, why is Tim Robbins apparently so irresistible to all the African American women he meets? What on God’s earth does it all mean? And most baffling of all, why is it so good? The key to the film is its structure: because the central intrigue is that we do not know why Tim Robbins is having these visions, or ultimately whether he is having them at all, we are never allowed to settle comfortably into the trappings of a recognizable genre. Indeed the manifold discomforts of Jacob’s Ladder start in one genre (a conspiracy-based suspense thriller, featuring a plot to silence Robbins and members of his platoon as they discover the State department’s use of experimental drugs on combat soldiers); segue into another (all-out horror scares from hideous, unexplained Lynch-ian hallucinations: a tooth in the top of a nurse’s skull; a tendril poking out from hobo’s clothing; those masked faces); and from there into a third (an existential, almost spiritual psychodrama about loneliness and despair). What’s utterly missing from this formula are the moments of respite you would expect from each of those genres. Roger Ebert, in his 3.5-star encomium for the Chicago Sun-Times compared Jacob’s Ladder favorably to Orson Welles’s The Trial, and called it “a thoroughly painful and depressing experience.” Oddly, he didn’t once mention how paralyzingly frightening it is. From the mind of screenwriter Bruce Joel Rubin (its first scare sequence is in the New York subway, familiar to fans of Rubin’s double Oscar-winner Ghost and Lyne’s zero-Oscar winner 9½ Weeks), this film has two things in common with The Exorcist: firstly its writer is a religious man unafraid to be explicit about this in the screenplay and secondly the spiritual aspects are so sophisticatedly manipulated that they render the drama more realistic (and more upsetting), not less. Post his experiences in Vietnam, having left his wife and family, Robbins’s Jacob alludes to the biblical names of his two children, Eli and Gabe (the latter died as an infant). When his new mistress (Peña), resentful of his hanging on to the past, fires back that her parents didn’t go in for biblical names, Jacob sniggers: “Where do you think Jezebel came from?” The tiny hint of comfort the film seems to promise us (and him) comes via the friendly figure of “guardian angel” Danny Aiello, Jacob’s chiropractor, who quotes 14th-century Christian mystic Eckhart von Hochheim by way of appearing to describe Jacob’s condition as an earthbound purgatory. Underpinning Rubin’s approach to the story is the Bardo Thodol (Tibetan Book of the Dead), a lesson for human consciousness in the moments after death: it is revealed at the end that Jacob has died on the slab in Vietnam, felled by the bayonet of one of his own men, rendered berserk by the hallucinogens—and all the subsequent action was a depiction of his soul in a liminal state. When one looks back at the major digital breakthroughs in visual effects they’re often spoken of in terms of wonder and beauty. We’ve become so inured to computer-generated movie magic that we may forget that early CG effects inspired not only astonishment but also, sometimes, fear. The immersive video game worlds of Tron, the gentle water creature in The Abyss, the liquid metal villain in Terminator 2, the life-like dinosaurs in Jurassic Park—though they meant to elicit different emotional responses, they all wowed for how they were seamlessly woven into the fabric of their films. They were causes for admiration, they made us smile and applaud at their audacity and for pointing toward the future. However, the groundbreaking effect in the very strange, very scary 1985 Hollywood film Young Sherlock Holmes—the first computer-generated animated character in film history—is something quite different. A stained-glass image of a medieval knight, come to life after springing forth from a window in a church, achieves in its photorealism only a chilling uncanniness. It’s a famous effect, but it’s frightening and flat and enigmatic, a cause for flinching rather than delight. The stained-glass knight sequence constitutes less than two minutes out of 109, but it’s a fairly good entry point for discussion of the movie as a whole. Young Sherlock Holmes manages to feel both antiquarian and newfangled, an unsettling marriage of state-of-the-art moviemaking and classical Holmes tropes that’s well attuned to the evocative, eerie feel of a library after hours. While the rest of the film’s many effects shots are more traditional stop-motion animation and puppet work, the overall sensibility of Young Sherlock Holmes is of an ’80s spectacular for the era of Indiana Jones and Star Wars. And no surprise that is, considering the triumvirate of hot young Hollywood talent behind it: Barry Levinson directed, Chris Columbus wrote the screenplay, and Steven Spielberg, in the heights of his King Midas phase, executive produced it with Amblin cohorts Kathleen Kennedy and Frank Marshall. All this would point toward the film being a product, and there is something undeniably impersonal about the project. But craft is craft, and, aided by a committed cast and crew, they achieved an unsettling, atmospheric creepshow, featuring enough devilish images to warrant its PG-13 rating, which had only been instituted one year before thanks to Spielberg’s other tyke-torturing nightmares Gremlins and Indiana Jones and the Temple of Doom. Who knows what Sir Arthur Conan Doyle would have made of the film’s amped-up horror spectacle, but that’s not for us to speculate. Set at a boarding school in London where the film supposes Sherlock Holmes (Nicholas Rowe) and John Watson (Alex Cox) met as teenagers, the film wastes no time in typifying its two heroes as the men we know they’ll become: Holmes is stoic, skeptical, and terrible at the violin; Watson is portly, pedantic, and reticent to join his newfound friend on his increasingly dangerous adventures. The conceit of the film’s main mystery seems to have been invented purely as a showcase for fanciful effects: a cloaked figure is stalking the school’s campus and outskirts at night, shooting poison-tipped darts that cause its targeted victims to hallucinate terrible, nightmarish visions that force them to kill themselves. Each of these constitutes a set piece, including a brazenly absurdist cold open in which a mustachioed man at a restaurant envisions that his roasted pheasant has come back to life and is trying to eat him; a local mad scientist—and a beloved friend of Sherlock’s—believing he’s being attacked by animated gargoyles with glowing red eyes; and another man thinking he’s caught fire. The most memorable of these, of course, is the priest attacked by the stained-glass knight, which is a scene of expertly mounting tension set in a quiet, candle-strewn church at night. The priest initially imagines that the window itself has altered: at first glance the knight stands heroically aside a robed religious figure; on second look, the man of the cloth has been felled, the sword tipped with blood. The window then quivers, as though it’s about to shatter, and the knight explodes into life, standing at human height with the priest, taunting him with its sword. Though it’s likely a shortcut for such untested CG wizardry, the choice to not animate the knight’s face, keeping it a placidly scowling plate of glass even as its spindly, wafer-thin hands and legs move, is what gives the effect the freakish, unforgiving quality of a waking nightmare. It’s amusing to think of the severe Dane of repute seeking to put asses in seats and score “boffo B.O.,” but the push and pull between haunted house pulp and high, personalized artistry in Vampyr is one of its many points of enduring interest, just as awkward and fruitful as its straddling of the silent and sound cinema worlds. Dreyer’s first sound film is a primarily imagistic mood piece, its power mostly extending from the visuals he was able to craft with the great cinematographer Rudolph Maté (who shot Joan of Arc and, as a fine director in his own right, is a perennial Subject for Further Research). Its reliance on title cards and lengthy shots of book text that deliver plot information is rooted in the silent era, as is Wolfgang Zeller’s macabre but somewhat hand-holding score, and the film has more in common with Nosferatu (1922) or The Cabinet of Dr. Caligari (1920) than a contemporaneous Universal Studios chiller like Tod Browning’s Dracula (1931). Still, Vampyr isn’t just a talkie by name, as the sound that’s there gains effectiveness by its scarcity. In an early scene, the hero Allan Grey, a student of the occult who’s investigating ancient horrors in the French commune of Courtempierre, receives an uninvited bedroom visit from a wandering old Lord in a fur robe whose daughters are in danger. “She mustn’t die! You understand?” he wheezes, and it’s scarier not knowing what he’s on about. Later, after Allan has blithely happened into their chateau (also uninvited), the Lord sounds desolately cheerful when he says, “The wounds have almost healed!” But all the bitten daughter, Leoné, can manage is, “The blood!”, and once near death, “I feel strong. My soul is free.” Later, a daughter will ask, “Why does the doctor only come at night?” (The answer is that he’s serving a vampire, and may be one himself.) These words aren’t great poetry, and the limits of technology and the fact that German, French, and English versions were being recorded simultaneously probably account for the dearth of longer dialogue scenes, but the sparseness makes the lines cling to you all the more, even as they’re subservient to the visuals. Dreyer, a former writer of title cards himself, lets those and the shots of the book gifted Allan by the old man (Die Seltsame Geschichte Der Vampyr by Paul Bonnat) do the bulk of the storytelling work, freeing him and Maté to play with movement, light and shadows. The pages remain on screen for a maddeningly long time, arresting the suspense, though this may be another symptom of the confusion between different versions. The impact of individual moments and scenes more than makes up for it, beginning with the iconic back-turned bell-ringer with oversized scythe who welcomes Allan and us into the film’s clammy world like a haunted boat ride maitre’d. Then there’s the camera holding on the “marked” Leoné’s wide, smiling face, stricken with madness, terror and ecstasy. Best of all is Allan’s death dream: having tripped violently in the woods, he proceeds to imagine a transparent version of himself entering a crypt and seeing his corpse at rest in a flower-strewn coffin. We then enter Allan’s POV (since become a hack move, here employed by a master), and watch through a window in the wood as the lid is slowly screwed on (a Poe-inspired primal fear) and the coffin carried through a procession. Along with these “show-stopping” moments from Dreyer the entertainer, there is an accrual of small details, like the witchy silhouetted weathervane, the eyeless lodger who greets Allan at his inn, and a peg-legged soldier (also a vampire henchman) whose own shadow walks up to him on a bench and sits down, while other phantom shadow couples dance nearby. Dreyer and Maté filmed through a piece of gauze placed a couple feet from the lens, lending everything a diaphanous eeriness, and many of the nighttime scenes (that is, every outdoor scene) are jarringly bright. The actors are mostly amateurs, with the exception of Maurice Schutz as the Lord of the Manor and Sybille Schmitz, who mesmerizes as Leoné. Schmitz was a German star and the inspiration for Fassbinder’s Veronika Voss; like Leoné and, not incidentally, Dreyer’s ignoble birth mother, Schmitz committed suicide (the possible personal meanings of Vampyr are well covered in Le Fanu’s essay and elsewhere). As Allan, Baron Nicolas de Gunzburg, aka Julian West, is less commanding (looking a bit dopey with slack jaw and vacant stare), but as the Baron was funding the whole adventure outside of the Danish studio system, one can’t quibble. As the doctor, Jan Hieronimko, discovered on the Paris Metro, has a perfectly scrunched, whiskered, four-eyed face that looks ahead to Brad Dourif’s Deadwood sawbones. Vampyr’s doctor dies in high style, excruciatingly buried in flour at a mill. When the elaborate machinery of wheels eventually ceases cranking, the film ends, perfectly expressing that the complicated magic act of cinema has come to rest. Generally agreed upon as an international breakthrough year for the horror genre, 1960 gave the world Psycho (U.S.), Eyes without a Face (France), Peeping Tom (UK), Jigoku (Japan), The Virgin Spring (Sweden), and Black Sunday (Italy), films that not only upped the ante in terms of depicting violence on-screen but each of which still registers as genuinely dangerous. Coming on the heels of this shift, Roger Corman’s 1961 The Pit and the Pendulum feelssomehow liberated, as though the developments over the past twelve months gave it license to shock. Of the eight films in Corman’s Edgar Allan Poe cycle at his American International Pictures, The Masque of the Red Death may be the most technically beautiful, The Raven the most wonderfully inexplicable, but The Pit and the Pendulum is the scariest: a tale well told that luxuriates in its sinister gothic trappings and delights in constantly pulling the rug out from under the viewer. Taking very little from Poe’s 1842 story, a non-supernatural tale that dramatizes in excruciating detail the torture of a young man during the Spanish Inquisition, Corman’s film only gives the pendulum itself something like a cameo appearance. Instead the script by Richard Matheson (whose seminal horror stories included sixteen episodes of The Twilight Zone, Spielberg’s Duel, and the 1954 zombie apocalypse cornerstone I Am Legend) lovingly synthesizes elements from various Poe tales, including, in addition to the title story, The Fall of the House of Usher and The Cask of Amontillado, while Corman spikes it with references to the recent crop of cinematic horror, including Psycho and Black Sunday, not to mention the film that likely inspired the entire horror wave, 1954's Diabolique. Despite the wild admixture of stuff—reflected in the beautifully oozing and commingling colored paints of the title sequence—the resulting horror free-for-all nevertheless feels tightly wound and eminently classical. Cue the backstory, which is a doozy and which makes Corman’s film something like a sequel to Poe’s tale rather than an adaptation. Nicholas’s father was a grand Inquisitor, who oversaw horrible tortures in the last century: “ . . . eyes gouged from bloody sockets, flesh burned black, ” Matheson’s script delights in telling us what Corman can’t show. In a film that comments upon its viewers’ morbid fascination with horror, we learn, in black-and-white, distorted wide-angle lens flashback, that at age ten Nicholas, obsessed with his father’s mysterious and terrible work, snuck down to the torture chamber, where he happened to see the unthinkable: his father killing his wife and brother for adultery. The child’s uncle was tortured to death; his mother walled up for eternity in a tomb while still living. After filling in the viewer and Francis on the tale’s wild Freudian foundation, Doctor Charles informs us that Nicholas, deranged from grief and haunted by the violent past, has come to believe that Elizabeth may have been buried prematurely, just like his mother. And that perhaps her ghost now haunts the castle, which seems likely to the viewer considering the strange voices and the harpsichord’s ability to play by itself in the middle of the night.